PLANTAR FASCIITIS | GEORGE D. GOUDELIS MD. 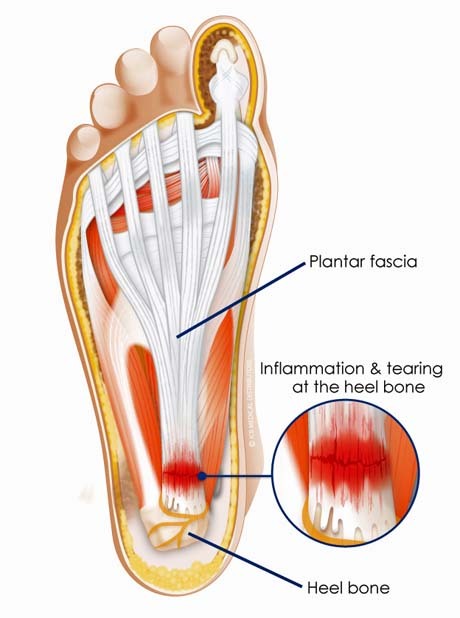 Ph.D.
Plantar heel pain may be caused by a variety of conditions, the most common of which is proximal plantar fasciitis or heel pain syndrome. The plantar fascia is a dense sheet of connective tissue that originates from a medial calcaneal tuberosity and inserts in multiple slips on the bases of the proximal phalanges and flexor tendon sheaths. The etiology of plantar fasciitis is not well understood but is generally thought to be related to degeneration and microtearing of the origin of the plantar fascia at the medial calcaneal tuberosity. An acute injury may be the precipitating event that initiates the process of inflammation and injury at this location, but frequently no specific traumatic event can be recalled. Calcaneal spurs, however may form as a result of chronic periostitis of the calcaneus at the origin of the plantar fascia. Approximately 10% of patients will develop persistent disabling symptoms. Patients typically report pain that is worse for the first few steps upon arising in the morning. This is thought to be a result of the equinus posturing of the foot during sleep and the resulting microtearing and inflammation than is reinitiated with the first few steps in the morning. Pain is also worse upon rising after long periods of rest. Obesity, occupations involving prolonged standing, long distance running, or hyperpronated feet have all been associated with plantar fasciitis. On physical examination, there is maximal tenderness at the medial plantar aspect of the calcaneal tuberosity. This is the most important finding in making a diagnosis of proximal plantar fasciitis. Radiographs may reveal the presence of a calcaneal spur. The absence of the spur not exclude the diagnosis of disease. 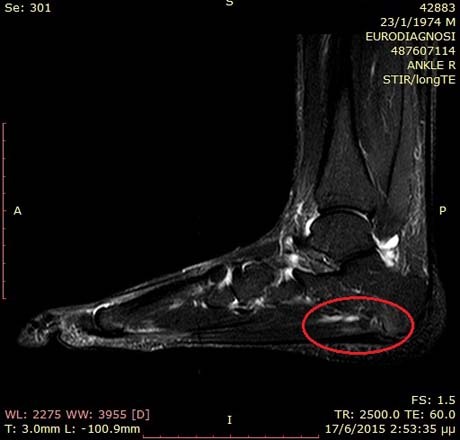 Magnetic resonance imaging of the foot reveals the anatomical details of soft tissue. 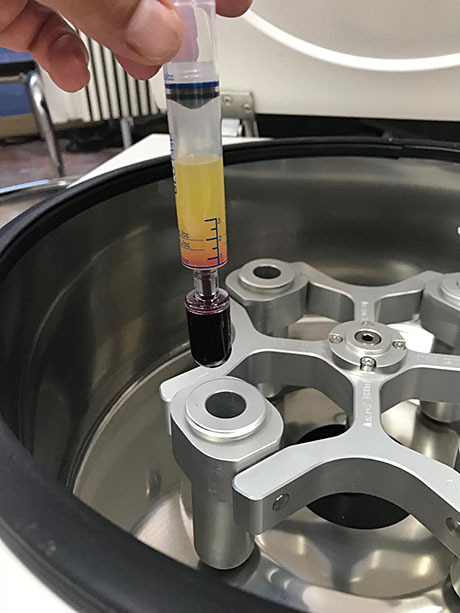 Autologous blood products have created a growing interest for use in a number of Orthopaedic therapies. The healing effects of plasma are supported by growth factors released by platelets . These growth factors induce a healing response. The evaluation of the foot anatomy is the cornerstone to address this difficult problem. The occurrence of a severe flat foot or other deviation from normal anatomic model of the foot (pes cavus,pes planovalgus, metatarsalgia, etc) are the cause of the problem. Conducting special foot examination, foot analysis, walk analysis and the construction of special pads that come in the patient's shoes is a first and essential approach to the problem. Weight loss in terms of the patient will help to reduce the loads exerted on the soles relieve the patient. Extracorporeal Shock wave ultrasound therapy alone or in combination with othew physical therapy modalities often gives a definitive solution. PRP (Platelet Rich Plasma), is the most modern autologous (from the patients blood), method. Most of the time due to the nature of the problem the combination of the above methods are needed to achieve a good and satisfactory result. Surgical treatment should be undertaken only after failure of conservative treatment for one year. The most common surgical procedure is a release of the partial plantar fascia with or without spur excision performed through a medial or oblique skin incision. A variety of surgical procedure have been described, however, ranging from partial to complete plantar fascia release to resection. 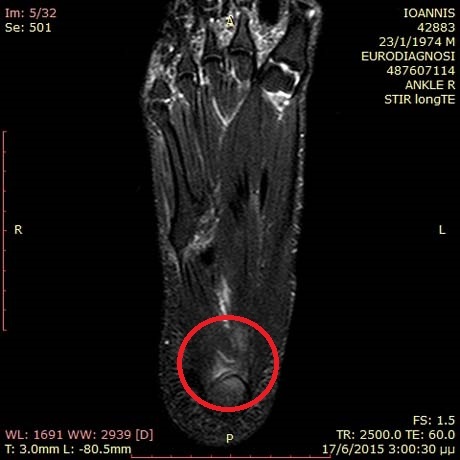 Limited (medial one-half) release of the plantar fascia may be necessary in refractory cases. Complete release can place the longitudinal arch of the foot at risk, overload the lateral column and lead to dorsolateral foot pain.